Those individuals that enjoy working with their hands may have a strong desire to carry out a challenging job every day. Maybe that is why some of these same individuals want to consider training in the heating and air conditioning business. You will find that according to the Bureau of Labor Statistics, these jobs are expected to grow and the job outlook is high. In fact, it has been assumed that these jobs are going to grow much faster than the national average. That is great to hear if you are looking for job security. Go ahead and find HVAC schools below that offer certificate and vocational training programs. When you think about heating and air conditioning systems you probably realize that these systems are going to be very complex. They will have numerous electrical components that not all individuals are going to be able to work on. When you enter into a program that is going to teach you the skills that you need to work in this field you are going to be learning about installation as well as repair. It will be important for you to be able to learn about blueprints and how to follow these in order to install a heater or air conditioner. You must also know how to install fuel lines and water lines as well. This can be very complex and time consuming. Therefore, your education is going to be very well rounded and intense. You may be expected to take classes in shop math, mechanical drawing, chemistry, electronics and even in computer electronics. Those individuals that would like to enter into a post secondary school will find that they may also learn about temperature control as well as equipment design. There are some individuals that are going to obtain their education through a trade school or a vocational school. Others may actually complete an apprenticeship to learn how to put the skills that they have learned to use. There are several programs out there that will include formal apprenticeships where the student will be paid for their on the job training and they are also going to receive classroom courses as well. While this can be very beneficial, these programs can be very long and last up to 5 years. Many HVAC colleges offer more than just standard certification programs, be sure to ask more questions once you contact any of the schools below. If you are thinking about getting this type of education then you may want to know where you are going to be able to find employment when you are finished with your schooling. The answer to that question is that you will be able to work just about anywhere. You may be able to work in hospitals, businesses, carrying out in home installation, and even in factories. When you think about all of the locations that need to have heating and air conditioning units, it is easy to see that you will be able to find a job just about anywhere. You can expect to work at least 40 hours a week when you do find a job. However, there are going to be times when you may need to work overtime. This may include evenings and even weekends. This will frequently happen during the peek seasons when individuals need to have their air conditioners or heaters repaired. Of course no school can every promise what you’ll make as a HVAC technician when you graduate but according to recent salary statistics HVAC installers can make $40,000-$68,000 per year. The salary range depends on several factors. The first factor is where you plan on working. The part of the country and the city you work in play a big factor in what you’ll make. The more populated of an area tends to demand the higher salary as jobs are more plentiful. The other factor is if you plan on being self-employed or work for an existing HVAC company. It is harder work owning your own business as you’ll need to do your own appointments, market your HVAC business, do your own budgeting and accounting, however the rewards are greater as you get all of the service fees that you would charge a residential or commercial property. Approximately 10% of all HVAC technicians own and operate their own business. When you think about HVAC one might just think about someone who installs their air conditioner but that would only be a small part of what duties HVAC technicians are responsible for. Residential HVAC installers do install air conditioners but also humidity machines, deal with air quality and duct work issues as well as deal with all of the necessary repairs that go along with owning such a system. Each season technicians are called to homes to fix broken equipment that could be electrical, fuel, or even water related. Things such as electrical rewiring, replacing old and even defective parts are a common occurrence for a technician. You’ll need to be trained by a school that will teach you not only about repairs but how to diagnose those issues when you arrive at the property. Technicians also have to say familiar and get trained on many of the newer types of systems on the market including water heated systems and solar powered homes. When dealing with solar panels you’ll need specialized classes so you are familiar with the installation but also the repairs needed. If you own your own HVAC business or work for a commercial HVAC company then you’ll be dealing with projects on a much larger scale. Commercial HVAC installers will be tasked to work on large refrigeration system some which are used in restaurants, hospitals and even packing plants. These types of businesses do employ HVAC technicians full-time as it is critical that their systems run 24/7 without any disruption. Becoming a HVAC technician is a rewarding career. Work hours are depending on where you work. Most technicians are full-time and they work for a company that sends them over to clients to do repairs or installations. You are paid to be a technician and typically have a salary. Your hours can vary but most work a typical 40 hour work week but can be called in after hours in the event of an emergency. If you work for yourself and own your own HVAC installation and repair business then you set your own hours. This usually depends on how many clients you have and if you deal with residential, commercial or both. Your work environment also can vary. If you live in Arizona or California for example you’ll probably deal more with outside AC systems vs. heating units. Most of your time will be spent outside in good weather. If working on the East Coast then you might be dealing with more heating units which most of the work tends to be on the inside of the home. Probably the most important step you need to take if you want to become a HVAC technician is to find the right training program. Many decide early on during high school that this is a trade they would like to be involved in. If this is the case and you are a high school senior you can begin to start researching the different trade schools in your area that offer HVAC training. Look for a school that is accredited and that offers training programs that can be completed in around 12 months. This is typical for most HVAC trade schools. Research the different schools in your area as more than likely they are all different in the way they teach. You’ll need to find a 100% hands-on school, not an online school as the training they need to teach you can only be handled in a classroom setting. Once you find a few schools and request information you can then schedule a campus tour so you can first-hand take a look at their facilities. Is it somewhere you think you’ll like to attend daily? Do you like the staff and instructors? Is the campus close to your home or current work? These are all factors you need to look at before you make your decision. Once you take the tour get the full tuition cost for the program as well as their graduation and placement rates. This is very important as you don’t want to attend a school that graduates 30% of their students and only 5% get jobs after they graduate. Every school must post and or supply this information to prospective students so make sure to ask for it when you have your meeting. When looking at tuition costs make sure to include application fees, lab fees and anything else the school may charge. We have seen schools that cost as little as $5000 for a program to as high as $30,000 so it is important to really research to make sure what you want to do is contained in the curriculum. The last step is to apply to the school and get started on your training. HVAC is a technical field and training is essential. You can obtain certification in many different specializations. Some of them are Electrical, Light Commercial Air Conditioning, Air Conditioning, Basic Refrigeration and Charging Procedures, Electric Heat, Gas Heat Certification, Oil Heat, Residential and Light Commercial Hydronic Heat, Heat Pump, Carbon Monoxide, System, Diagnostics and Troubleshooting Procedures, Fuel Oil Combustion, Natural Gas Combustion Analysis, Carbon Monoxide and Combustion Analysis, and Light Commercial Refrigeration. These different fields you can choose and specialize in. In any of these areas, you can enjoy job stability, but licensure is a very important step. In order to succeed in this industry, you must first complete training and then take the HVAC certification exam or licensing exams. Next step is to apply for an apprenticeship program in relevant field. After completion of that, you must apply for entry-level jobs. Every state has HVAC training schools that offer dedicated programs. These usually take 2 years to complete and some of the colleges even grant an associate’s degree in the process. As far as licensing is concerned only some states require the technician to have a license. In you are certified in HVAC, you can secure higher paying jobs. You can enroll for the HVAC Excellence program if you are just a beginner. It involves a few certification exams that you can select from. There are also professional level certifications but these often require employer level verifications. As there are many options, take full advantage of these programs and use the knowledge to boost your HVAC career. After the training, it is time for apprenticeship. It is recommended to enroll for a program at an experienced HVAC organization, as there will be more scope to learn. Utilize your time at the company and learn everything they have to offer. The apprenticeship period varies from company to company but can range from 6 to 36 months. During the apprenticeship program, the apprentice should have minimum 2,000 work hours and 144 hours of technical education. You will be taught blueprint reading, safety practices and also how to use various tools. Finally, when you apply for your first job, keep in mind that the company should enhance your career. You may also start job directly after completing training and obtaining certification or degree. There are several HVAC employers and contractors who hire entry-level technicians and then train them on-the-job. Many HVAC training and degree programs offer career placement assistance for fresh graduates. One of the great things about becoming an HVAC/R technician is that employment continues to be projected to increase faster than other like occupations. The main reason for this is homes and commercial businesses continue to be built and everyone requires a need for installation or HVAC repairs to take place on a yearly basis. Also as technology continues to improve and more advanced systems come to market including those with Wi-Fi capabilities and the ability to be changed by using your cell phone the need for more skilled technicians is rising. If you are someone who likes physical work, you can consider a career as an HVAC technician. 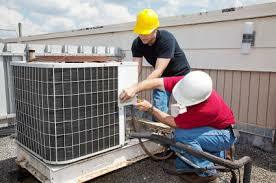 The term refers to people whose work involves work with refrigeration, heating, ventilation and air conditioning. Even though it is a great job, you need to be the right fit to do well in this line. Find an HVAC school today to get started. 1. Work under a building contractor for plumbing, heating or air conditioning work. 2. Find employment at companies that require such professional to install and maintain heating and cooling systems. This can include office buildings, schools, refrigerator and AC shops, Local and Federal government, hospitals and any other organization that operate large refrigeration, heating and AC systems. 3. Work as an independent contractor in any HVAC specialization. This is a very financially rewarding career where air conditioning, heating and refrigeration installers and mechanics get employer-sponsored benefits of different kinds. The benefits may include pension plans, health insurance and work-related training when needed. The employers also provide uniforms and allow access to company vans and professional tools. Around 15% of these mechanics are members of a union, which too provides them with many perks. According to data from the Bureau of Labor Statistics, employment opportunity for HVAC mechanics will increase 28% between 2008 and 2018. As the population of the nation inclines, the demand for commercial, residential and industrial climate control systems will increase as well. More people are now concerned about indoor air quality. They express environmental concerns. All of these are factors will positively impact career growth. In fact, these have contributed to new energy saving AC and heating systems. The Bureau also suggested that job prospect for refrigeration, air conditioning and heating device installers and mechanics is expected be great in the future. Especially those who obtain training from a formal apprenticeship or an accredited technical school can take advantage of the situation. In addition, many technicians are now going into retirement, which increases HVAC job openings all over United States. Many contractors are already reporting that there is a shortage of skilled technicians. Most of the technicians work full time. They can also sometimes serve during weekends and in evening shifts, depending on workload. They work during irregular hours especially during peak heating and cooling seasons. Construction contractors employ most of them. Only 10% of the HVAC technicians are self-employed workers who can decide their own shifts and schedules. Those who service heating, refrigeration, and air conditioning equipment usually have stable employment all year round. This happens because there are increasing number of contractors and manufacturers who provide service contracts. If you are seeking a new career with job security and stability, this is a career you might want to consider. If you are interested, you can look up a local HVAC training school and contact them. Sign up for training courses and start planning your career!